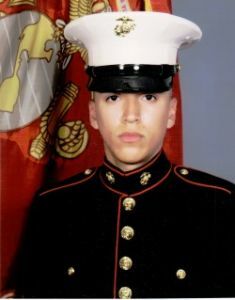 The Round Lake Area Exchange Club Hometown Hero Committee is honored to announce U.S. Marine Lance Corporal Alejandro Macias as the May hero. This month’s sponsor is Collision Solution located in Hainesville. Macias was registered at the Clubs site, www.rlaexchange.org/hero, by his very proud mother, Victoria L. Macias. The May hero, a Round Lake Park resident, graduated in 2010 from Round Lake Senior High School. “Alejandro is our ninth hero being honored and we along with his family are in awe of his service to country and joining during the time of war.” shared Sherry Ridge, the Hometown Hero Project Chair. Macias is currently in Jacksonville, NC. He just graduated from V-22 Airframes Mechanics School. “I always get chills and tears of pride when I speak with the family members of our heroes” said Ridge. His mother also shared that he earned an expert rifleman award. The Lance Corporal’s “Hanging with the Heroes” care package will be filled with chips, fruit, lots of chocolate along with a personalized “Hanging with the Heroes” t-shirt and letters from Round Lake Area School District 116 students. A requested item of a “Black Chicago skyline baseball cap” has been made, Ridge is working on finding this cap. The Club will present a plaque on behalf of the May Hometown Hero to his family at their meeting on May 25. The meeting is held at Panera Bread in Round Lake Beach, 7:30 a.m.
Any and all military personnel serving overseas or in the USA from any of the Round Lake Areas, Hainesville, Fox Lake or Ingleside qualify for the program. Five minutes will get them registered. If you have a neighbor, family member, friend, employee, employer, etc. serving in the military please register them by going to www.rlaexchange.org/hero. We look forward to announcing the June Hometown Hero. For more information visit the web site or you can contact Sherry Ridge at 847-740-2379.